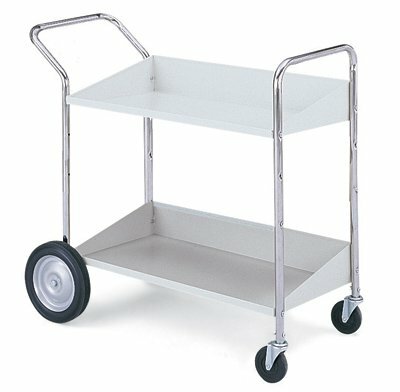 Two Shelf MobileCartMobilecarts bring organization to your facility. Sorttransport mail, store office supplies, pick parts inwarehouseeveryday tasks become more efficient withbin carts. Designed to carry heavy loads inoffice, mail center, mail room or warehouse. Specifications:Strong tubular steel frame.4" Front swivel casters10" semi pneumatic rear tires.Chrome handles18 gauge steel - nickel chrome plated, durablecorrosion resistant.Welded in axel brackets10" rear wheels.Front handle is punchedour office-storage-supplies bolt-in 4" swivel casters.Each shelf is 18 gauge steelis double weldedstrength. Edgeshemmed so thereno sharp edges when reachingpackages.Add optional corrugated totes or plastic bins to your cart, sold separately part number 1577 or part number 5009 Cart Capacity: Holds up to 4 corrugated totes(1577) or 6 standard black bins (5009)cart. Totesbins sold separatelylink above. Dimensions: Overall: 40"L x 21-1/2"W x 36-3/4"H Shelves: 31-1/2"L x 17-1/2"W x 1-1/2"H -(back) Color: Chrome handles withgrey shelves.